Give Others a Hand Up – Not Just a Hand Out! Success and True Happiness through Empowering Others. GET THE LIMITED-TIME AVAILABLE TO YOU. CLICK HERE WHILST STOCKS LAST. If You Aren’t Getting the Results You Want in Life, … in Relationships, …in Business…- Should You Be Asking What You Are Contributing to the Community? - Are You Taking, but Not Giving? Astute mangers and entrepreneurs see the value and the benefits of win / win situations. Businesses that are also focused on what they can do for the community invariably prosper whilst those focused solely on profit can fall short. Progressive businesses not only work for their community but also with the community. And whether you have a staff of one, or 50, or 50,000 your business has much to offer – be it advice, training, mentoring, knowledge or skills transfer, personnel, sponsorship of community activities and organizations and individuals – the list is almost endless. – But so too are the benefits to you and your business. 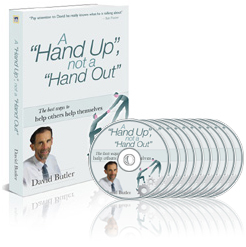 So Why not Get Your Copy of the First Chapter of my very readable book A “Hand Up”, not a “Hand Out” – The best ways to help others help themselves. And I’ll also give you an MP3 recording of this chapter so that you can listen on your iPod or in your car. - and Enjoy your Complimentary First Chapter Plus the Bonus MP3 Recording of Chapter 1. How Community-focused is Your Business? Well-run, successful businesses know the value of working for and with their communities, they know the value of being a good community citizen. Every business can make an incredible difference to the lives of many. Moreover, they NEVER lose – in fact they benefit through the good-will gained and the high standing in their communities. Success and prosperity follow naturally. And whilst many businesses worldwide do realize the value of community focus here is an example of what one Aussie business has achieved in a few short years. CottonOn markets designer label clothing through its 350 stores across Australia, New Zealand, Singapore, Malaysia and (soon) Hong Kong. And through the CottonOn Foundation the company is able to be involved first hand with projects such as constructing new schools, assisting with agriculture and supplying much needed equipment to support sustainable infrastructure in south-eastern Uganda, as well as projects closer to home including Rainbow Riders, an amazing charity assisting disadvantaged youth through building self-confidence through care of horses, and Run Geelong, a fundraiser for redevelopment of the Children's Ward of Geelong Hospital. Assisting a village over 12,000 kilometres away and also acting locally, the Cotton On Foundation is a good example that communities both near and afar are important and deserving of our interest and support. A key objective of the Foundation is in helping remote and disadvantaged communities around the globe. Two of Cotton On’s fundraisers, Message In A Bottle and bags, raise money for these purposes. Tarte Empower Flower Palette Review! Ello, please enjoy this review and swatches of this limited edition ~spring~ palette from Tarte Cosmetics! This palette is available at Sephora or Tarte.com. XOXO.